Size of the Industry Today India has more than 20,000 outlets in operation, probably the highest for any country. Geographical distribution Mumbai, Ahmedabad, Coimbatore, New Delhi, Surat, Chennai, Delhi, Jaipur, Bangalore, Kolkata, Karur, Tirupur, Ludhiana, Bhilwara, Erode, Jodhpur, Rajkot, Noida, Panipat, Amritsar, Vadodara, Kanpur, Madurai, Gurgaon, Hyderabad, Navi Mumbai, Tirupur ,Thane, Shanghai, Pune, Karachi, Faridabad, Indore, Ghaziabad, Varanasi, Faisalabad, Alappuzha. Output per annum The high volumes of low cost distempers sold in India, which amounts to approximately 200,000 tonnes per annum at an average cost of Rs35 per kg ($0.88) at the present rate. The history of Indian Paint Industry is as old as the history of the Indian people. The earliest examples of Indian painting are cave paintings going back to 10,000 B.C. The tradition of painting in Indian subcontinent grew and developed over time, resulting in a fully developed and finest style, incorporating the culture and faith of the region and religion. Indian paints always embrace rich color and clear symbolism, using specific iconography to make religious figures clearly recognizable. History of Indian Paint has fascinated culture throughout the years. Color has been the major attraction for more than 20,000 years. Two anthropologists conducted a worldwide study of color naming in 1960's. Many languages only contained two color they are the white (light) and black (dark).Today after all the research and finding we have numerous combination colors of : black, white, red, orange, yellow, green, blue, purple, pink, grey and brown. Paint is generally made up of a pigment. Latex Paint: good for applicability and it dries much quickly & easier to wash.
One-Coat Paint: It is the more expensive version of the latex and alkyd paints and is mostly chosen for surfaces that require flawlessness in color. 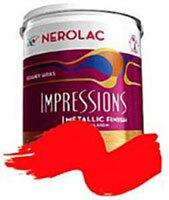 Primers: paint used in the initiation for all interior paint works. Rubber-Base Paint: This is best for concrete and bricks. Textured Paint: If need is to cover any flawed surface in your house get this paint. It works well on ceilings. There is a phenomenal growth on the housing sector front with rapid urbanization and availability of easy to secure housing loans which have become the prime drivers of growth in the decorative paint segment, which comprises 70% of the $2 billion Indian Paint industry. An average increase of growth of about 10% in the automobile sector contributes to 50% of the revenues in the industrial paints segment. 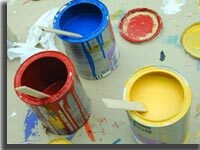 Paints can be classified as Decorative Paints & Industrial Paints. Decorative Paints are usually meant for the housing sector. Distemper is mostly affordable by all and used in the suburban and rural markets. Interestingly, 20% of all decorative paints in India are distempers. Indian Paint products are highly in demand in countries of United States, China, India, United Kingdom, Australia, Pakistan, Hong Kong, Canada, etc forming the turning points in the Paint Industry of India. The paint products are being governed by FERA (Foreign Exchange Regulations Act) and MRTP (Monopolies & Restrictive Trade Practices Act), Indian companies were restricted from enhancing their production capacity. Due to liberalization there shackles were taken off and the industry expanded. Today manufacturers in India hardly face any threat from the foreign players. Most of them have deals with global players in terms of latest technology and markets accessibility. Mumbai, Ahmedabad, Coimbatore, New Delhi, Surat, Chennai, Delhi, Jaipur, Bangalore, Kolkata, Karur, Tirupur, Ludhiana, Bhilwara, Erode, Jodhpur, Rajkot, Noida, Panipat, Amritsar, Vadodara, Kanpur, Madurai, Gurgaon, Hyderabad, Navi Mumbai, Tiruppur ,Thane, Shanghai, Pune, Karachi, , Faridabad, Indore, Ghaziabad, Varanasi, Faisalabad, Alappuzha. The Indian paint market in many ways is different from other markets. It has been unique market when compared to the other markets in the world. India has over more than 50000 paint shops or outlets. Indian paint company's distribution policy directly cater to more than 25,000 shops and is unlike other industries where companies operate through distributors. Each Paint company has a large number of depots to service these outlets and a large sales force for this purpose. A large number of Paint outlet or shops have automated/manual dealer tinting systems. Today India has more than 20,000 outlets in operation, probably the highest for any country. There are only approximately 7,000 tinting systems in China for a market two and half times of India's size. 30% to the paint industry revenue in India is accumulated from Industrial Paints. The size of the Paint Indian industry is around 940 million litres and is valued at approximately $2 billion. The organized sector comprises 54% of the total volume and 65% of the value.In the last ten years, the Indian Paint Industry has grown at a compounded annual growth rate (CAGR) of 12-13%. The market for paints in India is expected to grow at 1.5 times to 2 times GDP growth rate in the next five years. With GDP growth expected to be over and above 7% levels, the top three players are likely to clock above industry growth rates. There are high volumes of low cost distempers sold in India, which amounts to approximately 200,000 tons per annum at an average cost of Rs35 per kg ($0.88) at the present rate. The employment potential in this industry is huge. Job prospects are many for the one who is professionally qualified in Paint Technology. One will find employment in large paint manufacturing companies like Asian Paints India Limited, Shalimar Paints, Jenson and Nicholson, Berger Paints India Limited, Nerolac Paints Limited, etc. One may also be posted in the technical service department as a Technical Assistant or Technical Executive. In this capacity, one will have to visit the site when required. Moreover, one can also work in the research and development department, if one has an M. Tech. Degree under one's belt. Besides, one will also find employment as a Supervisor in the application unit of an auto industry. There is huge demand for Paint Technologists in companies which are into the manufacture of home furnishings like almirahs, refrigerators, etc. One will be able to find employment in such home furnishing industries. Indian Paint Industry today is about Rs 49 billion sector which has demands for paints which is relatively price-elastic but is linked to the industrial and economical growth. Indian per capita consumption of paints is at 0.5 kg per annum if compared with 4 kgs in the South East Asian nations and 22 kgs in developed countries. Organized sector in India controls 70% of the total market with the remaining 30% being in the hands of nearly 2000 small-scale units. In India 30% accounts for the industrial paint segment in paint Industry while the decorative paint segment accounts for 70 % of paints sold in India. Indian housing sectors boom, increasing urbanization had made easy availability of housing loans and a shift from semi-permanent to permanent housing structures have been driving growth in the decorative paints segment accounting for nearly 65-70% of the Indian paint industry. Seasons are also involved in the demand for decorative paints, where consumption peaks around festive time. Globally, Indian Industrial Paints segment accounts for a major share which indicates that this segment offers many opportunities for paint manufacturers. In June 2009 with a recovery in realty sector, the production volumes in the sector have substantially recovered. In the year 2009-2010 the Production of paints grew by a robust 25.2% during as compared to a 40 basis points drop in production in the corresponding year-ago period. As the production of passenger cars is expected to grow by 15.3% in 2010-11 the demand for automotive paints will continue to remain healthy as sales are expected to grow in double-digits. And with realty majors launching new projects, construction activity is expected to gain momentum and generate demand for decorative paints. Rise in demand is expected to be supported by higher supply as the industry is expected to commission additional capacity in 2010-11.